Object Project interns Caitlin Kearney and Kamilah Stinnett explore the origins of packaged candy, a modern convenience that signaled the shift toward Halloween as a widespread commercial holiday. Object Project, opening July 2015, will explore everyday things that transformed daily life. Did you know that the average jack-o'-lantern bucket holds about 250 pieces of candy? That's 9,000 calories and about three pounds of sugar, according to the California Milk Processor Board. Good grief! No wonder some parents scramble to ration their kids' Halloween haul. Children play a game with apples at a Halloween party at Frederick Douglass Community Center in Washington, D.C., sometime in the 1940s. Henry Bazemore Collection of Frederick Douglass Dwellings Photographs, Anacostia Community Museum Archives, Smithsonian Institution, gift of Henry Bazemore. But the treats that fill those grinning plastic pumpkins on Halloween didn't always come in crinkly wrappers with familiar names like Baby Ruth, introduced in 1920, and M&M's, first sold in 1941. During our time at the museum, we've researched packaged, premade food items for Object Project. The exhibition will give visitors a look at—er, taste of—the history behind objects that have changed daily life, including the social demands and technological advances that brought about these changes. One section of Object Project will explore transformations in what Americans eat and how they eat it. The modern development of prepackaged food items, for example, changed family dinner and snack time alike. Bisquick's biscuit mix, created by General Mills in 1930, promised, "Makes Anybody a Perfect Biscuit Maker." The premade mix ensured perfectly measured ingredients and a consistently great taste, and it made baking a quick, everyday activity rather than a planned out, time-consuming task. Similarly, Kraft Macaroni and Cheese Dinner offered packets of pre-grated cheese and fast-cooking pasta, so Americans could whip up quick dinners for the whole family. Created in 1937, the mac and cheese meals were also an inexpensive way to buy groceries during World War II rationing. Even frozen desserts came individually packaged, like Eskimo Pies. Invented in 1920, Eskimo Pie was the first chocolate-covered ice cream bar. Eskimo Pie Fudge Pie box, Archives Center, National Museum of American History. Image #02055306. Items like Birds Eye Frosted Foods frozen broccoli (1930) and Nescafé instant coffee (1938) gave Americans more options at the grocery store—and more time to do things like care for children, take on other household projects, or work outside the home. Such convenience foods gave rise to the market for prepackaged candies, and the impact of that innovation can be seen in every handful of wrapped goodies dropped into trick-or-treaters' buckets. Celebrating Halloween by gathering a haul of individually wrapped treats is a relatively recent change in the custom of trick-or-treating, a tradition that hasn't been popular in America for very long. Halloween celebrations caught on in the late 1800s, but they weren't the door-to-door dashes for candy we know today. Back then, Halloween parties were held at home—as pranks and even vandalism grew to plague public spaces on Halloween. (The November 1, 1943, issue of the Washington Post reported one such crime: "Halloween Vandals Knock Nose Off Capitol's Justice Statue.") The mischief of the holiday persisted until celebrations became more community focused starting in the 1940s and into the 1950s. 1944 Halloween party at Frederick Douglass Community Center in Washington, D.C. Henry Bazemore Collection of Frederick Douglass Dwellings Photographs, Anacostia Community Museum Archives, Smithsonian Institution, gift of Henry Bazemore. Knocking on strangers' doors for goodies then became more common, but it wasn’t candy that was handed out at first. Trick-or-treaters would have received homemade items like cookies, cake, or popcorn balls, in addition to apples, coins, and small trinkets. They might also have been invited in for some snacks and Halloween-themed games. Parties could include bobbing for apples and seasonal goodies, like devil's food cupcakes with orange and black frosting and doughnuts. Blindfolded child pinning a doughnut to a jack-o'-lantern's mouth, ca. 1930-1940. Sally L. Steinberg Collection of Doughnut Ephemera, Archives Center, National Museum of American History. Starting in the 1950s, more candy companies focused on taking advantage of the commercial opportunity Halloween offered. Packaged candies became increasingly popular and convenient for moms—mostly women handed out the treats—because they were pre-wrapped and required no preparation. At the time, only a few candy makers could afford to run national advertisements, and Mars was among the first to promote candy specifically for trick-or-treating. A Mars ad in the October 25, 1954 issue of Life magazine features a ghost enjoying the "haunting flavor" of the Milky Way (first introduced in 1923). Brach's Candy Corn has also been around since the 1920s and is still produced in large volume today—nine billion pieces a year. Early on, the tricolor confection was likened to chicken feed and advertised with an image of a rooster. Though it now has primarily autumnal associations, in the 1950s the sugary corn was advertised as a candy for all seasons, which "all children love to nibble on all year long." Along with Minute Rice (1949) and TV dinners (1954), individually packaged candies became yet another way to make time for other activities. And as trick-or-treating grew in popularity, inexpensive pre-wrapped candies became more economical to hand out to the increasing number of costumed kids. Caramel apples also became a popular treat in the 1950s, when a Kraft Foods employee experimented with leftover caramels after Halloween. Those, too, became mass produced items thanks to the invention of an automated caramel apple machine in 1960. Trick-or-treaters continued to get a mixed bag of packaged candy and homemade goodies until the 1970s, when parents became more suspicious of homemade items. They didn't know exactly what was in the homemade products, but they trusted the sealed candies with recognizable brands. 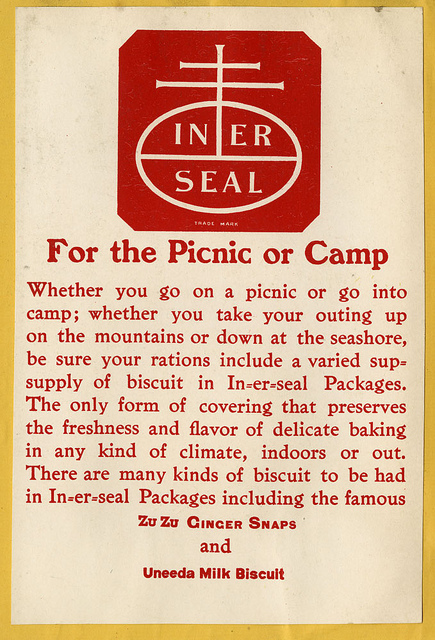 Convenience combined with safety was already a selling point for Nabisco's Uneeda Biscuits (1899)—sealed wrappers meant they were fresh and sanitary, along with maintaining a consistent flavor. We now carry our packaged Halloween candies in plastic jack-o'-lantern pails that look remarkably similar to this paper-mache lantern, which would have been used for decoration. The jack-o'-lantern symbol has been associated with Halloween for several hundred years, well before we started using it to collect our sugary loot. A ca. 1940 paper-mache jack-o'-lantern, used for decoration. Home and Community Life collection. 1992.3112.01. Keep an eye out for some perennial classics this year: while you're enjoying a Butterfinger (1923), Dubble Bubble (1928), or Almond Joy (1946), you're getting some bite-sized history with your sugar fix! Kamilah Stinnett was an Object Project summer 2014 intern, and she attends the Museum Studies program at The George Washington University. Caitlin Kearney is an Object Project fall 2014 intern and also attends the Museum Studies program. Kearney has blogged about making DIY deodorant from a 1903 recipe for Object Project.